Primayer is a Gold Sponsor of this year’s WaterAid Ball. The main sponsor is Anglian Water, the water utility which is leading the way in preventing water leaks thanks to Primayer products and intelligent technologies. This event will be packed with entertainment beginning at 6pm with a champagne reception. There will once again be a Silent Auction with a range of fantastic items up for grabs. Guests can bid using just their mobile phone and see the highest bid for each of the lots on large screens in the ballroom. We are looking forward to another wonderful evening which will raise lots of money for WaterAid. WaterAid is an international not-for-profit organisation, determined to make clean water, decent toilets and good hygiene normal for everyone, everywhere, within a generation. By tackling these three essentials in ways that last, people have their lives changed for the better and forever. Primayer’s very own Super Villain Kevin Brook and Super Hero Lisa White will be attending with their partners. Enjoy yourselves, it’s in an excellent cause! 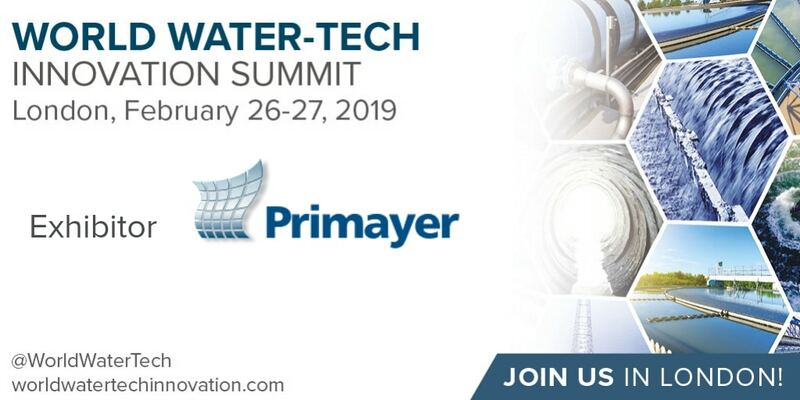 The 2019 World Water-Tech Innovation Summit is where water utility leaders, start-ups, technology giants, engineers and investors from all over the globe come to find solutions to today’s challenges of digitisation, security, energy recovery and new water resources. Primayer will be exhibiting at the conference and we look forward to meeting everyone.